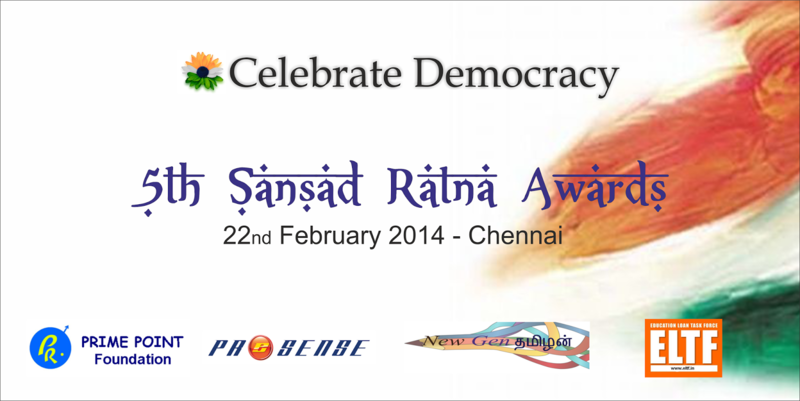 Sansad Ratna Team is pleased to announce the 'Sansad Ratna 2014' Awards for top performing Lok Sabha Members to be presented on Saturday the 22nd February 2014 at Chennai Press Club in the presence of media. (updated on 9th Feb 2014). This year's theme is "CELEBRATE DEMOCRACY"
Shri N Gopalswami, Former Chief Election Commissioner of India has kindly consented to be the Chief Guest and present the Awards. Generally, voters do not have proper awareness about the duties of Parliamentarians. They expect the Parliamentarians to get employment or transfer for their relatives; involve themselves in the local duties like panchayat presidents. As per the founders of Indian constitution, the Parliament members have to make laws, supervise the government functions, discuss the budget and take up the problems of voters. All the Parliament members are expected to participate in debates, introduce private members bills, raise questions and to attend the House regularly. In the earlier years, the awards were presented to the toppers under (a) debates (b) private members bills and (c) questions. The purpose of honouring the top performers is to create awareness about the functioning of the Parliament among the people and to encourage the performers to do much better. 15th Lok Sabha started functioning on 1st June 2009 and the regular business started on 4th June 2009. Till 18th Dec 2013, this Lok Sabha conducted 15 Sessions with 345 sittings. Though the correct data is yet to be released, it is estimated that nearly 33% of the Lok Sabha was lost due to disruptions and forced adjournments. The team has decided to honour all the Lok Sabha Members with a total tally of 1000 and above (Debates +private bills + Questions) during the 5 years period. As per the data released by PRS India up to 18th December 2013 covering the entire 15th Lok Sabha, the following 9 Members become eligible for 'Sansad Ratna 2014' Awards. 9 MPs who are getting Sansad Ratna Awards for the overall performance in the 15th Lok Sabha. From 2013, toppers among the Women MPs are also selected for 'Sansad Mahila Ratna' Award. The following 3 MPs have become eligible for the 'Sansad Mahila Ratna Award 2014' for their overall performance in the 15th Lok Sabha. The selection was done based on the total tally of debates, private members bills and questions. In 2013, we introduced Sansad Yuva Ratna Award for the young MPs. This time, it was decided to honour one Lok Sabha MP under the age of 40 for the overall performance based on the total tally. Mr Pradeep Kumar Majhi (Congress MP from Orissa) has become eligible under this category. Since he has scored more than 1000 points, he is included under the Sansad Ratna category.